Les Vins du Siècle est un grand site fédérateur, bilingue et mondial. Dans toute la France, « triés sur le volet », les meilleurs producteurs (la très grande majorité ayant l’exclusivité de leur appellation) sont retenus pour la typicité des vins, leur rapport qualité-prix-plaisir, l'expression de leur terroir et leur passion de vignerons. Pas de vins à la mode, surcôtés ou de "jus de bois" dans Les Vins du Siècle. La typicité d’un vin, ce n’est rien d’autre que l’association d’un sol, d’un micro-climat, d’une plante et d’un homme. On ne peut aimer un vin qu’en appréciant celui qui le fait. Derrière une étiquette, il y a un viticulteur (ou une viticultrice) et c’est fondamental de ne pas les dissocier. 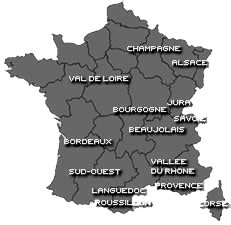 Bien sûr, les sols ont une influence considérable et, dans chaque territoire, dans chaque commune, le vigneron fait la différence avec son voisin. Il ne s’agit donc pas seulement de faire du bon vin, ce que tout le monde peut faire, mais surtout d’élever de vrais vins racés, reconnaissables entre mille, qui sentent ce “fumé” bourguignon, déploient ce “velours” libournais, ces senteurs alsaciennes, cette “chair” en Médoc ou à Châteauneuf, cette “minéralité” à Pouilly ou à Meursault, cette fraîcheur en Champagne comme dans nos grands liquoreux. In 1970, the winegrowing is converted with the biological culture, the first applications of organic-dynamie beginning in 1981. Starting from harvest 1986, the Demeter mention is obtained, and, since harvest 2002, the wine is not stopped any more with cork but with capsules crowns in Inox, to avoid the organoleptic deviations (savors and aromas) caused by the stoppers cork. Wine making without any additive, manual grape harvest, indigenous yeasts, maturing on the lees during 9 months. Much liked Gewurztraminer 2009, with these subtle connotations where intermingle the ripe white fruits, the fresh spices and flowers, of intense mouth. 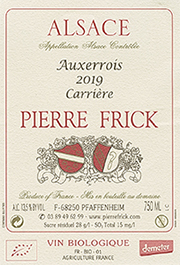 Excellent Pinot white Carrière 2008, intense, associating structure and smoothness, all in harmony, of persistent mouth, ideal on an bass with white butter. Riesling Bihl 2009, very delicate like this attractive Sylvaner Bergweingarten 2007, sharp, with quite typical notes of citrus fruits (grapefruit), of fruity mouth. Crémant beautiful of Alsace 2008, foam very beading and very persistent, a wine rich, tasty, where one finds nuances of lemon and honey. Taste its original vintage, the Blanc de noirs 2009, a beautiful expression of the very ripe Pinot noir vinified in white. “A manner of vinifying a Pinot noir, specifies me Jean-Pierre Frick, without correction and additives (except a little sulfur after racking). Always naturalness! Coppered yellow robe, intense and complex undergrowth aromas, liquorice, mild tobacco, yellow fruits and truffle, stops full and nervous, beautiful association with a turkey with wild mushrooms.” Superb Gewurztraminer Grand cru Eichberg Vendanges Tardives 2005, a fleshy and complex great wine, where the brioche, the flowers and honey intermingle, of a great intensity to the palate. All in consistency, Pinot gris Vendanges Tardives Grand cru Vorbourg 2008 is a great wine, with the fruity and floral notes intense, with a honey point, dissolve, of guard. The grounds of the Château Toulouze depended on a vast land unit, property of the Château de Vayres. This last built in XIIIème century with the site of a Gallo-Roman “oppidum” which prevails the Dordogne, was one of the residences of the king Henri IV. Property in its current form, 27 ha of only one holding, buildings and vineyard, corresponds to what remains of a vast domain wine and maturing of more than 70 ha, built with delicate of the XVIIIème century, following the French revolution and dismantled gradually by the play of the successions. The vineyard completely restructured in 1986, starts to express the rise to power of the expression of the soil. That gives wines to the flesh fuller, generous, fruity but with impressed elegant tannins of smoothnesses. Well-balanced and harmonious wines, that one can taste young people after a broad ventilation out of carafe, but who offer according to the vintages an excellent potential of guard, on average from 10 to 15 years. 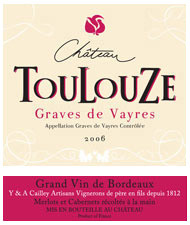 Discover this Graves de Vayres Grande cuvée 2009 (majority Merlot, 20% of Cabernets, manual and late grape harvest to seek maturity, maturing 12 months into 1/2 muids of oak, bottled 18 months after the grape harvest, soft filtration), with these notes characteristic and very persistent of currant, smoked and spices, with dense and ripe tannins at the same time, a full wine of mouth, excellent guard. Beautiful 2008, robust, quite fleshy, with currant and plum scents, fleshy, with tasty tannins, which releases in mouth of the connotations of black cherry and humus, of guard. Château La Galiane owes its name to Galian, an English general who commanded his troops here during their occupation of Aquitaine in the 15th century. This has been a family estate for several generations and has a surface area of 5 hectares planted with 45 % Merlot, 50 % Cabernet Sauvignon and 5% Petit Verdot, a combination which gives that perfect, classical balance which is so typical of the Margaux appellation. The vineyard is planted on slopes with fine gravel soils. 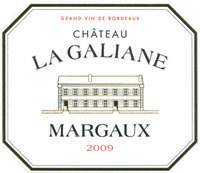 These wine-growers from father to son produce La Galiane wines with a lovely ruby-red colour and a fine bouquet, very harmonious and smooth in the mouth. The tannins are fine and elegant and the wines have good ageing capacity. Château Charmant has 5 hectares of vines which are a hundred years old and planted on fine gravel soils with lots of pebbles which are ploughed. Harvesting is done by hand and the vatting process is long in order to extract all the aromas before maturing the wine in barrels for 12 months. Château Charmant produces an aromatic wine with good colour, very complex and elegant, perfectly balanced, well-structured and supple at the same time and opening out delightfully with age. The GELIN winegrowing is a family property of a dozen hectares on the communes of Fixin and Gevrey-Chambertin. The property created in 1925 by Pierre Gelin is now exploited by Pierre-Emmanuel son who integrated the company in September 2000. 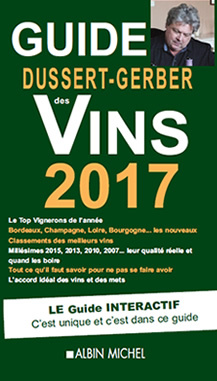 Types of wines: Bourgogne Passetoutgrain, Bourgogne aligoté, Bourgogne red, Fixin 1ers crus Les Hervelets, Les Arvelets and the Clos Napoléon (Monopole), Gevrey Chambertin “Clos de Meixvelles” (monopole), Gevrey Chambertin 1er cru Clos Prieur et Chambertin Clos de Bèze. The methods of culture are traditional, the limited outputs and the manual grape harvest. After a maturing out of barrels of 22/24 month old oak, the wines are bottled at the property. One is obviously at the top with this Fixin Premier Cru Clos Napoleon 2009, 50 year old vines, manual grape harvest, matured 22 month out of barrels of oak, very full, of robe crimson, which associates structure and distinction, to the characteristic nose where are guessed the ripe fruits, the humus and the spices (grooves, pepper), all stops some, fleshy, of beautiful evolution. The 2008 are of a great complexity, with the characteristic nose prevailed by the cooked fruits and liquorice, of powerful structure, with these tannins quite present, of rich mouth (morello cherry, humus, spices). Superb 2007, an intense wine with the nose, which associates structure and distinction, with these notes of smoked quite specific, one of best tasted this year. Tasty 2006, garnet-red robe and reflections crimsons. Nose complexes where mix with the notes of soft spices (vanilla and grooves) and of stone-fruits, beautiful fresh attack stops some, tannins is unctuous, molten and delicately underlines the powerful and persistent kirsch aromas. Beautiful minerality continuing on vanilla finally. The 2005, are a great wine where intermingle with the notes of red small fruits with core quite ripe, of pepper and liquorice, of cordial and powerful mouth, a wine obviously still very young. Fixin 2009, scented, with the typical undergrowth and blackberry connotations, is of beautiful structure, a wine which fills up the mouth well. There are also this attractive and rare white Fixin, an elegant and suave wine, very traditional, of intense robe, rich with the nose as in mouth, all in aromatic nuances (lime, hazel nut). Cédric Chignard took the responsability for this winegrowing of 8 ha since 2007 (4th generation). Her father, Michel, impassioned owner knew to transmit his values to him in order to let as well as possible express the soil according to each vintage, and mature large Fleurie as one should see some more often, that is wine where elegance is combined with a tannic presence good real. The grape harvest is manual, the traditional wine making by whole bunches, and the maturing is done out of tanks, tuns or barrels. Superb Fleurie Les Moriers 2011, which owes its secular notoriety with a privileged ground, resulting from the granite where it plunges its roots, of color crimson, with complex nuances of fruits of wood, violet and plum, very delicate but very structured, promising success. The 2010, with the intense nose where the ripe fruits (currant, strawberry) and the humus intermingle, are a fullbodied wine, with tannins present and tasty, matured very well, combining powerfull and smoothness, of guard. Fleurie cuvée Spéciale Vieilles Vignes 2010 is really remarkable, a wine of color steady cherry, with the cooked fruit aromas (strawberry, currant) and undergrowth, very well-balanced, with tannins firm and melted at the same time, with this finely spiced mouth. Beautiful 2009, of mouth intense and prevailed by blackberry and the violet, a wine combining suppleness and aromatic, harmonious and very well-balanced intensity, which agrees perfectly with a leg, but deserves to be preserved for better benefitting from its potential. Many rewards obtained and largely deserved.